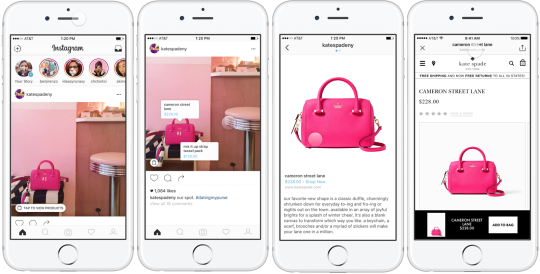 Yesterday Instagram announced that they will be going eCommerce with the introduction of Instagram shopping. The photo-sharing giant which reached 500 million monthly active users as of June this year currently enjoys a steady stream of photo updates. Millions of graciously contributed photos per day to the platform have an untapped shopping intent and potential. Now that the user base has been established and businesses have come on board to Instagram with I'm sure a little help and influence from big brother Facebook. Insta has decided to allow more monetisation of the platform in recent months. One step to monetisation was launching the Instagram business account, which gives users access to reports like reach, impressions, profile views and demographics. You can also boost your post reaches and set up multiple contact points for users visiting your profile, like email or call, giving businesses a little taste of the Instagram audiences. According to selfstartr, only 36% of marketers are using Instagram for business, compared to the 93% who use Facebook. Then businesses were given a sponsored spot in users Instagram feeds. You can do this via your Facebook for businesses account and as you would facebook set up ad campaigns and sponsor your content, target select audiences, set your spend and daily budget and all that jazz. I won't be going down that rabbit hole so don't worry. Being rolled out in the US only as of this month, to 20 selected retailers Instagram have given the privilege of testing out Instagram shopping. Many users share images of products they love on Instagram but there has always been a disconnect between "wow I love that" and "how do I get it". Traditionally you would have to leave Instagram and prepare yourself for the longest google image search of your life or DM the person who posted it and hope for the best. So with this user behaviour in mind, Instagram has decided to package a workaround and sell it to retailers. It may be basic but what it essentially does is turns your Instagram feed into a digital storefront and the process will be as follows.